What if you were the perfect leading lady, being wooed and chased by the most endearing leading men? Spouting off heartfelt lines scored perfectly by haunting and emotional songs and melodies? Wouldn’t you just love that? That was what Erin Javier‘s life was like. Well that was her life on the theater stage at least. At 23, Erin has already headlined some of the most successful plays at Teatro Lakambini, but she has yet to fall in love or even really kiss a boy off stage. A certified NBSB, she’s now wondering if her heart would really get a chance to skip a beat, flutter and feel REAL love, not one prompted by different acts/scripts or perfected by countless rehearsals. With their next musical well underway a love story that is struck by tragedy, unknown to Erin there’s another love story about to present itself, hers. 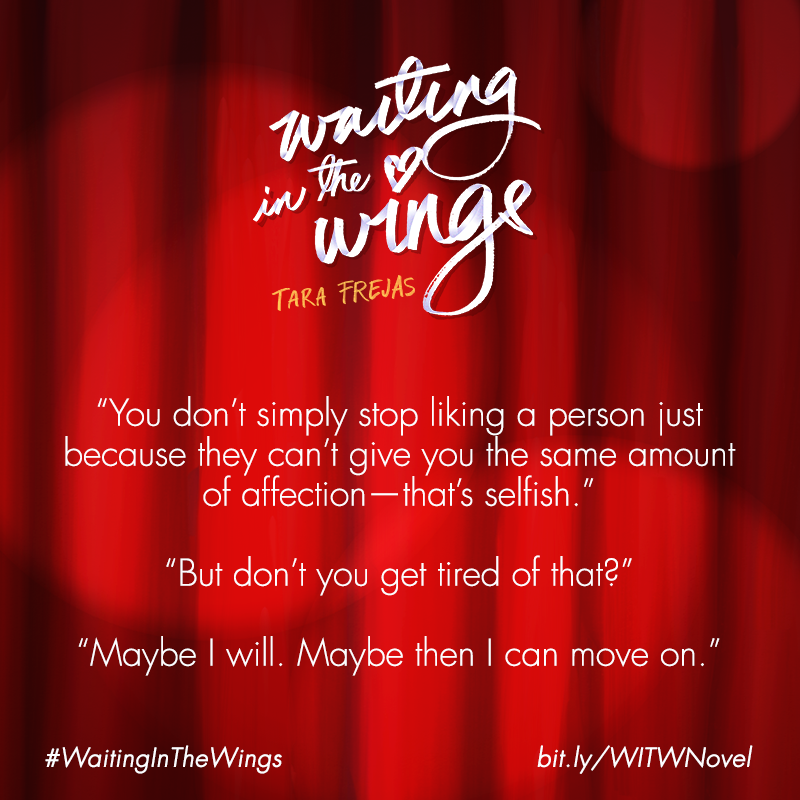 Tara Frejas’ latest novel Waiting in the Wings is a light-hearted new adult romance which will give you all kinds of ‘feels’. It is set in the backdrop of a flourishing theater company (Teatro Lakambini) who is about to start a musical production (Hanggang Ulap). 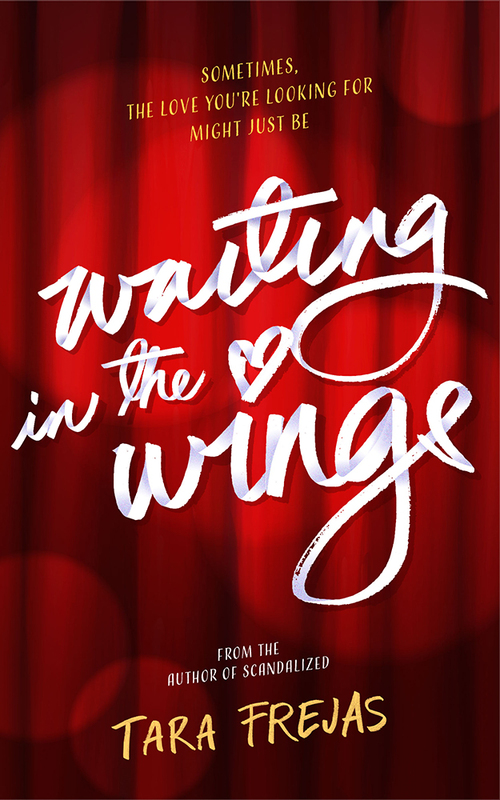 It is complete with heartwarming song lyrics and swoon-worthy love letters, Waiting in the Wings proves to be one delightful and ‘kilig’ read. The story starts as Erin finds herself wanting to take a backseat in their latest production opting to do her part behind the scenes instead of auditioning for the lead role. She wanted to take the time off to maybe try to put herself “out there” in real life. Now that she realizes she hasn’t really tried to make an effort to date or maybe just get to know guys in order to get to that first step of falling in love. I like that Tara Frejas didn’t write Erin’s character as a desperate, sad or pathetic girl JUST looking for love, not that there’s anything wrong with that really. There was genuine longing to Erin and also realness in her expectations. Putting a hand against his chest, he exhaled a long breath, convinced now that Erin Javier was birthed into this world to kill him. Gently, with a warm smile on her face. To say that I was torn about these guys would be an understatement. Throughout the book, they’ve proved themselves worthy, showed their vulnerable sides and even their imperfections. Waiting in the Wings will make your heart flutter, it will make you giddy and confused and you’ll see yourself slowly falling in love with not just one but maybe even to both of these guys. They are not without flaws including Erin but that only makes them so relatable. Just as what I felt when reading “Forget You Brew”, I’m amazed at Tara’s ability to really transport me to the scenes in the book. With every description, the sounds and the feel of it. She has this talent to really make you part of the scene. One of my favorites would be that rooftop scene where it made me feel all swoony. Tara captured that moment so perfectly. She also writes one of the best and colorful supporting characters who puts more texture and fun to the story. They have their own distinct personalities that it doesn’t feel like they were written in just for the sake of having other characters. They don’t feel out-of-place but they are as imperative to the narrative as the leads. It will even pique your curiosity, you’ll want to get to know their back story and make you wanna beg the author to write a separate book/novella about them (Yes, I’m talking about Hiraya and Jericho!haha). I also like the crossovers that you’ll read in this book (I see what you did there!). It’s always fun to read and encounter these characters just like a friend you haven’t seen in a long while. This once again proves why Tara Frejas is one of my favorite local romance authors. Her ability to introduce you to wonderful characters and transport you into different scenes in her book is simply unique.